“Joe” is an important specimen, and we want to share it with the world! Of course, you can visit the skeleton on display at the Alf Museum, but if that is not possible, a digital model is the next best thing. Using CT scans and a special photographic technique called photogrammetry, researchers produced a series of 3D models of “Joe”. Models for the fossil skull, reconstructed skull, nasal passages, and skeleton are presented here, viewable through most web browers. For even more detailed models, check out the original scientific paper, which has a full set of links to relevant files. 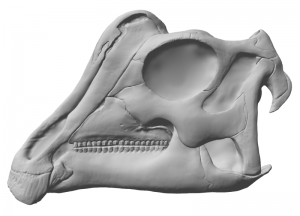 A digital model of the skull of “Joe”, by Ville Sinkkonen. To explore a 3D version, visit this page.